Price, as interpreted by candles, is the most important factor to consider on a chart. Put away the technical indicators. You do not need them. Technical indicators serve one purpose: to confuse novice traders! There isn't anything on a chart that can be learned from them. Everything you need to know is right in front of you in the candles! The moving averages are lined up. We want the 10 SMA above the 30 EMA and we also want there to be plenty of space in between the two moving averages. This creates the Traders Action Zone (TAZ) that we can trade in. If the moving averages move too close together, then a trading range or basing pattern will likely develop. We don't want that! There was a breakout recently. This is good! We want to buy a pullback as close as possible to a breakout as we can. Why? We want to know that there is interest in a stock. Remember that institutional traders have to accumulate shares over time. They can't buy tons of shares all at once. They have to buy a little at a time. By looking for break outs, we can expect them to have to buy more in the future. This will propel the stock higher. This is a smooth chart. We don't want to trade stocks that are whipping around everywhere! That is a good way to get stopped out on trades. This stock is in a smooth uptrend that can be traded with confidence, and without fear of getting shaken out of the trade. In this example, there aren't any significant chart patterns. This is fine. You don't need any kind of a chart pattern like a cup and handle pattern, or a triangle to trade a stock. You do, however, want to be able to identify them when they are there. This could add some weight to the setup and may make us favor one trade over another. There are wide range candles in the direction of the trend. See how at the end of August there are three wide range candles that close near the top of their range? There was also a wide range candle on the breakout in July. This is very significant! In fact it may be one of the most significant things on the chart. Stocks tend to move in the direction of wide range candles. There is one significant gap. There is only one significant gap to the upside on the breakout in July. Ideally, we would like to see more. A better case scenario would be if there was a more recent gap. Why? Because stocks tend to move in the direction of gaps! Be careful though. 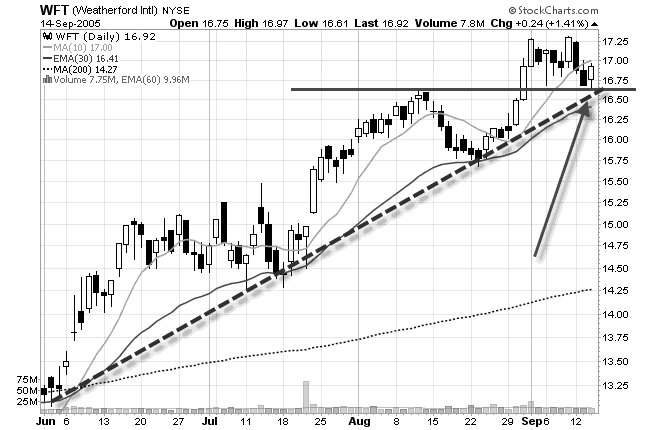 After three or more gaps, a stock can become overbought and may not continue to move forward. How do we know this? We know by looking for "tails" or "shadows" at the bottom of the candles. On the sixth of September there is a tail, and on this day (green arrow) there is a tail. This is very significant! You want to see that the big players are coming in to support the stock. You want them to protect you from any downside risk. This stock is at support. 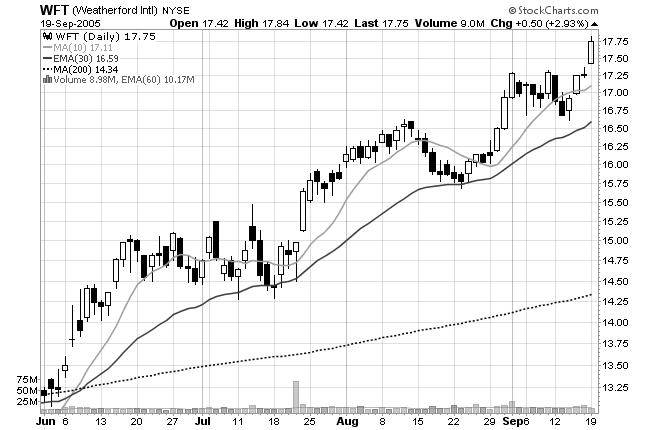 This stock has pulled back to a prior high made in the middle of August. This is identified by the red/green support line drawn on the chart. When a stock pulls back to a prior high it is known as minor support. It is still a significant support area, just not as significant as if it pulled back to a prior low. For example, if the stock pulled back to the prior low at $15.68 (see chart), then it would be major support. Also, notice how the lower trend line and the support line converge into one right at today's candle (green arrow). This is very significant! This increases the strength of the support. This stock is at a Fibonacci retracement level. There are three Fibonacci retracement levels that you look at: 38.2%, 50%, and 61.8%. This stock has pulled back to the 38.2% level (not shown on the chart above). You want to trade pullbacks to this level or the 50% level. If it goes down to the 61.8% level, it may be signaling weakness. Avoid those stocks. Note that this level also corresponds with the support line. Volume is showing that there is interest in the stock. See the big volume on up days and the lower volume on down days? This is the ideal scenario but it isn't absolutely necessary. I tend to favor low volume pullbacks over high volume pullbacks but I will trade both. If a stock is pulling back on low volume, it means that traders have lost interest in the stock and things get really quiet. This is usually when institutional traders come in: when everyone forgets about the stock! This concludes our analysis of the stock. We have determined that we are going to trade this stock! Want to see what happens next? Nice! All of our analysis has paid off. This stock has successfully moved in our favor and now we can just trail our stops under the lows of the candles until stopped out. I know it seems like a lot of work went into analyzing this chart but what can I say? Trading stocks does take some work! It will, however, get faster with time. After you look at thousands and thousands of charts in this manner, everything will become second nature. Instead of it taking minutes to look at a chart - it will take seconds!